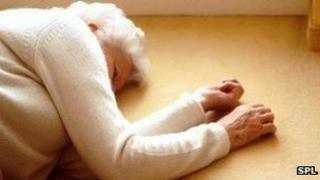 A fear of falling is making many elderly people prisoners in their own homes, a survey has suggested. More than one in five of the 500 people aged 75 and older, interviewed by the Women's Royal Voluntary Service charity, lived in fear of falling. And 5% are so fearful that they will not leave their homes unaccompanied, the report found. A third of them had suffered falls in recent years and a fifth of these said they had lost confidence as a result. Many said they were especially worried during winter months. A quarter said poor street conditions - poor lighting and uneven pavements - made them feel less confident about leaving the house. David McCullough, chief executive of the WRVS, said: "These are bleak findings. "With winter approaching, older people have little confidence to get out and about because they fear they will fall and, as this research shows, the psychological effects of worrying about a fall can be as debilitating and devastating as physical injuries." Every year in the UK nearly three-quarters of a million people aged over 60 end up in the local A&E department after a fall, and one in three of these will end up staying in hospital because of their injuries. Figures show around a third of adults who are over 65 and living at home will experience at least one fall a year. This rises to half of adults over 80 who are either at home or in residential care. In 2009 in England and Wales, there were 3,593 deaths as a result of falls. Making small changes at home, such as using non-slip rugs and mats and ensuring that rooms are clutter-free and well lit, can help prevent falls. Michelle Mitchell, of the charity Age UK, said: "At their worst falls can be the cause of death, but falls are not an inevitable part of ageing - many falls can be prevented and there is much that can be done to help people who have fallen not to fall again."